Crusaders manager Stephen Baxter issued a ‘hands off’ warning to cross-channel clubs offering trials to teenage sensation Gavin Whyte. The 18-year-old was again in brilliant form in his team’s win over Ballinamallard United at Seaview – a victory that took the North Belfast boys to the top of the Danske Bank Premiership table. He shot the Crues into an early lead before setting up a second for Jordan Owens. Billy Joe Burns completed the job with a third in injury time. It’s hardly surprising the performances of Whyte is beginning to turn a few heads in England and Scotland, but Baxter is in no mood to hand out any favours. “I haven’t received any telephone calls from anyone stating they would like to buy this kid. I’ve had few requesting a trial. But I can say to any club, the answer is no,” said Baxter. “He will not be going on trial with anyone. If they want to see him, come and watch him. “Every time a good player emerges, the obvious question is can he go across the water. He’ll go when he is ready and if a club wants to take a chance and pay the money for him. “This kid is an exceptional talent, but he has to continue to produce top rate displays on a consistent basis. If and when the scouts come to see him, they’ll watch him over a six-game period or so, just to see the level of consistency. We’ll not let him get too far ahead of himself. Although Baxter’s boys now lead the way, in terms of the title race, the manager is keen to keep the lid and any euphoria in the dressing room. He added: “There is a long way to go, with many football matches still to play. “We are now top of the pile, but in two weeks’ time we could be down in third or fourth. It’s been like that all season. “We fell six points off the lead following our defeat by Portadown, but we’ve now won five on the spin. So it’s a case of hanging in there and keep working hard. 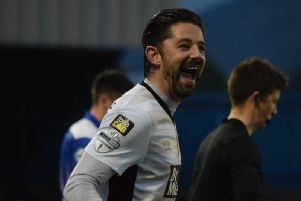 “Yes, it has been a brilliant holiday period with wins over Cliftonville, Linfield and now Ballinamallard. In fairness, I reckon we deserved the nine points from the three games, but I don’t think anyone would deny us that but no one will becoming carried away. “The players will not be allowed to bask in the sunshine of a few wins. We’ll take everything in our stride – keep the players ticking over. “We are concentrating on making sure that we are playing well and doing the right things. “Other results went for us this week, by the same token, they could go against us next time. United boss Whitey Anderson admits his lads now face a relegation fight for the remainder of the campaign. “I’m still confident we can stay in this league, but I’ve told the boys they have a battle on their hands,” said Anderson. “When you come to places like Seaview you have to dig in. We didn’t do that – there is no point in trying to paper over the cracks. “It was a poor mistake by our goalkeeper (Stefan McCusker) for the first goal. In fairness, he made a blunder but he pulled off some fantastic saves. He’s still only 24 – he’s a lot to learn. He certainly bailed us out. “We have a very young, naïve team. There are about seven or eight players playing this league for the first time.